Charles Hallbauer was born near Rubeland by Blankenburg, Harz, Germany to parents unknown at this time on December 5th 1829. This information was translated from an old German Hymnbook and was originally written by Charles Hallbauer. Anna Sophia Schloo was born to unknown parents near Otterndorf, Hannover, Germany on July 24, 1830. Otterndorf is a town on the North Sea, in the region of Lower Saxony in Germany. The town is at the mouth of the river Medem on the Elbe delta. Sophie married Charles Hallbauer on August 29, 1854 in Germany. The departed from Bremerhaven for America on September 28, 1854. We do not know at this time the port in America where they landed. From the birthplaces of their children we do know that they lived in Chicago for a few years, probably 1854 to 1859. Emma Aiefa Dorthea Hallbauer was born on March 16, 1856 and Henry Carl Wilhelm Hallbauer was born on April 9, 1858 in Chicago. The 1860 Census has Charles and Sophie located in ward three in St. Louis, Missouri. Although there is no street address in this census, in the 1860 St. Louis City Directory we find the following listing. This location is in north St. Louis probably near Cass Avenue and Grand Blvd. On May 8, 1861 Charles enlisted in the 3rd US Reserve Corp of the Missouri Infantry. This regiment was organized at Turner Hall in the City of St. Louis early in the year and was mustered into the US Services. The regiment participated in the Capture of Camp Jackson. It was mustered out on August 18, 1861 and Charles was discharged August 22, 1861. Camp Jackson was located in the area between Grand Ave and Garrison St. and Lindell Blvd. and Laclede Ave. in St. Louis. Part of the camps area is now the ground of Frost Campus of St. Louis University. engagement, made a successful retreat, via Carthage, Sarcoxie and Mount Vernon, to Springfield. From here a portion of the Regiment returned to St. Louis on the 25th of July, under command of Lieutenant Colonel Bischoff, to be mustered out on account of expiration of term of service. The other portion of the Regiment took part in the scouts and skirmishes to the Southwest and formed, with other troops, Sigel's Column in the battle of Wilson's Creek. The Regiment returned to St. Louis August 25. Some Companies reorganized immediately, and were, on January 8, 1862, consolidated for the three years' service under Colonel Isaac F. Shepard. that on the 17 of October 1861 Charles lost all fingers on his right hand in an accident with a circular saw while working at a bucket factory at the corner of 22nd and Chouteau Ave.
Augusta Emilie Marie Hallbauer was born on October 12, 1863 in St. Louis and Frederick Georg and Carl Emil Hallbauer (twins) were born on February 24, 1866 in St. Louis Mo. consumption. Charles wrote in his Hymnbook "May her ashes rest in peace as her suffering was great in this world." The 1870 census has Charles located in ward four of St. Louis. He is listed working as a carpenter, so he seemed to have adapted to the loss of his fingers. His oldest daughter Emma at 14 is keeping house taking over after the death of her mother. Henry 12 and Augusta 7 are listed at school. Charles, 3 is listed at home. The 1880 cencus finds Charles, 54, living at 2375 Papin Street near Jefferson in south St. Louis. He is working in a sawmill. Henry who is 21 and Charles who is 14 are living with him and are both employed. There is also a Mina Duerkob, 67, living in the household and listed as keeping house. About 1895 Charles relocates to Denmark Illinois where his son Charles lives, however in 1898 Charles decided to move to the National Soldiers home in Milwaukee Wisconsin. It is from there that he applied for a pension from the government based on his service in the Civil War and was granted $20.00 per month. information on him. This included his military history with dates mustered in and out, his disability, when and how it happened. His domestic history lists him as being born December 5, 1829 and is five ft. nine and has a rudy complexion. It notes he can read and write, is a carpenter, enter home from Denmark Illinois is widowed and list his nearest kin as a friend Fred Rogge (who is also in the home). Why this gentleman is listed instead of one of his children is unknown, we do know that he is in touch with his family as we have postcards between him and his granddaughter Lena Jost. He enters the home on May 19, 1897 and leaves the home on January 7, 1913 according to the records. The 1910 census again has him located in the National Soldiers Home in Milwaukee Wisconsin. He is 80 years old. It does list the year of his immigration as 1854 and that he can read and write. Charles Hallbauer at the National Soldiers Home. Charles is the rocking chair, front row, fourth from left. Charles Hallbauer, an old veteran of the Civil War, passed away Thursday Morning, Jan. 7 at 6:30 o'clock, after a lingering illness of 6 months. The deceased emigrated from Germany Sept. 28, 1854. He settled in Chicago and remained there for about 5 years, from there moved to St. Louis and remained there for about 37 years. From there he moved to Denmark and lived at this place for about 3 years. 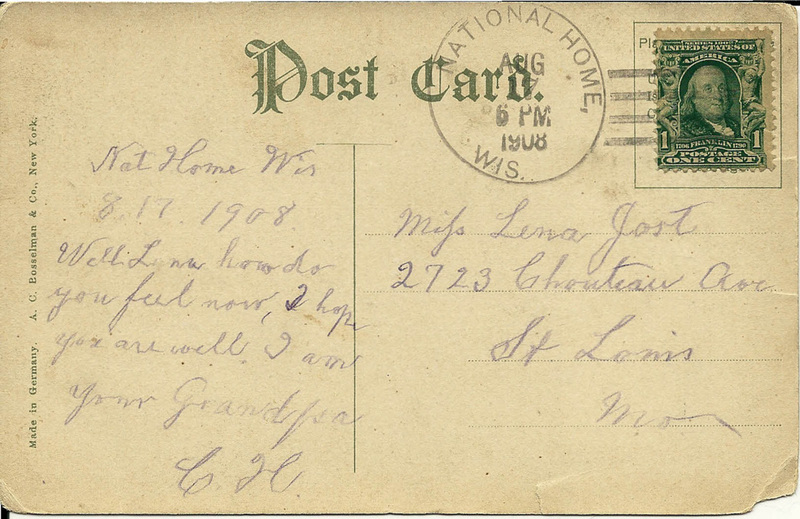 In 1898 he went to the National Soldiers Home in Milwaukee Wis. and remained there until a year ago. The remainder of his life was passed with his son, Charles Hallbauer of Cutler. The deceased leaves to morn his loss two children, 18 grandchildren, and 7 Great grandchildren. At the time of his death, he was 84 years 1 month and 3 days old. The funeral services were conducted by Rev R. C. Smith at the Denmark Church. Internment took place in the Denmark Cemetery.